A new report puts the average national asking price at €195,000. Click here to see in more detail. THE AMOUNT OF properties on the housing market is at its lowest level since 2007, a new report has found. The figures also show that prices have risen by 14% over the past year, largely due to a 25% increase in the capital, with the average national asking price now standing at €195,000, up €25,000 from a year ago. This average price is now just over half of the €380,000 peak during the boom years. The findings are contained Daft.ie’s Q3 House Price Report, published this morning. A separate report published last week recorded a similar national asking price of €191,000. Daft.ie economist and report author Ronan Lyons said there is the concern is that this dramatic supply shortage “is now feeding into expectations”. “While price rises driven by shortages can be stopped by increasing supply, tackling price rises driven by expectations is significantly trickier,” Lyons said. The report also conducted a survey of 1,000 potential home buyers, and found that they expect prices to rise in Dublin by as much as 12% over the next year. There’s also an expectation that prices across the country will continue to rise by as much as 6%. 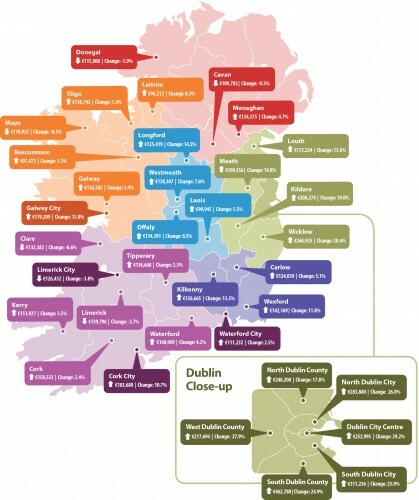 Over the course of the past year, prices have risen by 18% in North County Dublin and 29% in Dublin city centre. Surrounding counties also recorded a double-digit increase. Prices roses by 11%, 13%, and 3% in the cities of Cork, Galway, and Waterford respectively, while Limerick prices continued to fall, with a decrease of 4%. TheJournal.ie is part of Journal Media Ltd, which has some shareholders in common with shareholders in Daft.ie. Email “Number of properties on the market 'at lowest level' since 2007”. Feedback on “Number of properties on the market 'at lowest level' since 2007”.